« Best Gaming PC With The GTX 1070, What Should You Look For? Before explaining everything that the VG278Q has in store let’s list all of the features that are most important. 27″ of screen space, for me, is the sweet spot of screen size. It doesn’t feel like it takes up all of the room of the desk while also providing a large area to get the full picture when in-game. I used a 21″ screen is my main screen for a long time and I now use it as a second monitor to the VG278Q and the difference is definitely noticeable. The height, tilting, swivel and pivot adjustments wasn’t really necessary for me but it’s very intuitive. You can move it however you like. Sliding it up or down is extremely easy, you simply put the adjustable stand right in place with the base of the monitor and it’s ready to be moved however you see fit. It could work as a monitor for a standing desk with how much it can tilt back, you could have it as a vertical monitor if need be and moving it up and down makes it so that you can have your perfect spot while gaming. To be honest with you, the internal speakers aren’t anything to boast about. If you’re serious about wanting high quality sound then you’ll want to get some actual external stereo speakers. They’ll be alright for a little while if you plan on saving up to get some speakers but the internal speakers here simply don’t cut it. Compared to external speakers, the difference is black and white. There are plenty of settings to navigate within the VG278Q’s interface. It’s nice to see that ASUS included FreeSync with their monitor. For those of you with AMD cards you’ll be able to utilize this feature which was created to make sure that there is absolutely no screen tearing in game. It syncs your card up perfectly with the monitor. I will say that I use a GTX 1070 with this monitor which means that I am not able to utilize the FreeSync feature. However, I personally don’t see why I would have to. I do not notice any screen tearing while FreeSync is not being used. The user interface for the monitor is extremely easy to navigate and use. It’s easily the best interface I’ve personally used on a monitor screen. There is a directional dial on the back-right side of the monitor which is used to go into all of the different settings. Here you can adjust a blue light filter, change the preset visuals, adjust color options such as brightness, change the internal speaker sound levels, input select and save settings into a favorites bar. It’s important to note that whatever input type you decide to use you’ll need to make sure the monitor is set to it from this menu. If you’re using the DisplayPort on the monitor then make sure you dictate that within its menu. Arguably though, the most important settings about any monitor comes down to its image quality, refresh rate and response time. Let’s go ahead and go over those specs in more detail. This monitor is the absolute, ideal choice when you’re in the market for high quality 1080p/144hz/1ms monitor. I like to compare it to the ASUS VS228H monitor because of how much of a difference there is not only in terms of the refresh rate and response time but also with overall features. I have used and am still using it as a second monitor for over 6 years now which should say plenty about how long ASUS products are able to last. It’s proof for me that ASUS products are made with durability and future-proof in mind. 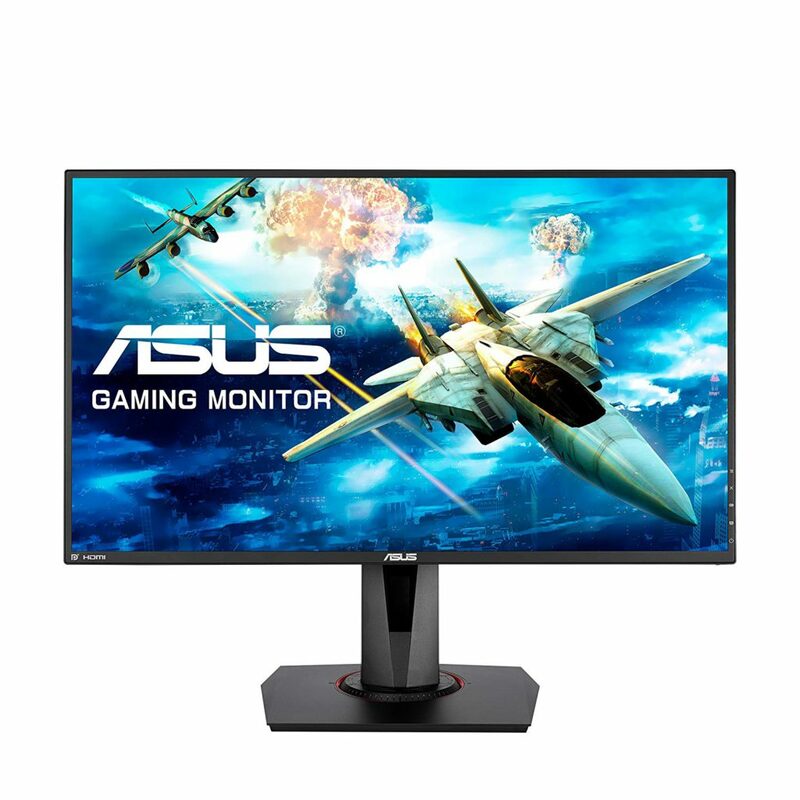 The VG278Q has a lot more going on and it’s a completely different monitor but the strive for perfection from ASUS is what should be looked at really with any of their products but monitors especially. If outdated models can last for over 6 years, odds are that newer models are going to last even longer. The VS228H model is comparable yet it’s not. It’s made from the same company but the VG278Q has the higher refresh rate, the lower response time and more options of use. Let’s go over what refresh rate and response time really means and what it means in terms of this monitor for gaming compared to older models that were also awesome in their own way. Refresh rate is basically the number of times per second that your monitor will update itself with new information. 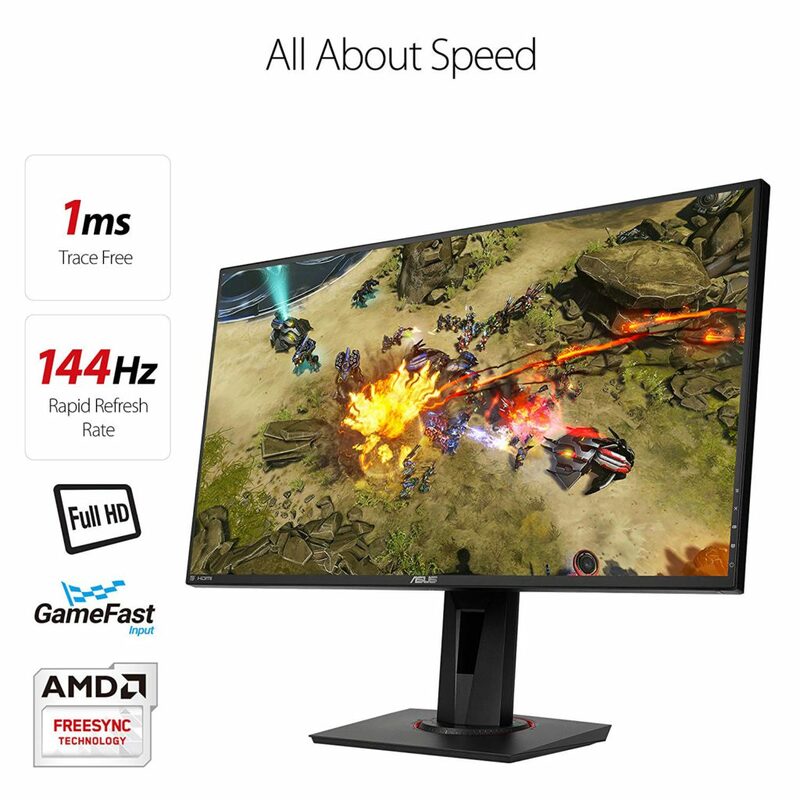 For example, a 60hz monitor will be able to show a maximum of 60 frames per second for images, animations and anything else on the monitor because that the number of times per second that the monitor can refresh itself. So even if you are running a game at over 100 frames per second, if you don’t have a monitor that can refresh itself at least 100 times per second then you aren’t going to be able to see a real 100 FPS. Since the VG278Q monitor has a refresh rate of 144hz then it will be able to display up to 144 frames per second for games. Response time is how fast a pixel on a monitor can display a change from one shade of grey to another or from black to white. This is important for gaming since the amount of motion blur is caused by a lot of moving images which makes pixels do those transitions. For example, if you have a high response time then certain fast moving objects will leave a noticeable trail behind which is a no go when you’re trying to react to an opponent’s movements. Response time is often mistaken as the amount of time it takes a monitor to recognize a key click or a button press but that’s actually called input lag. Compared to older models, such as the VS228H – it had a 60hz refresh rate and a 5ms response time. For the price it actually has great specs, just like the VG278Q. It’s hard to find a 27″, 144hz, 1080p and 1ms monitor that costs less than what this one costs. To summarize this review I’ll list a few of the pros and cons of going with this monitor. All in all, you’ve got to ask yourself if this monitor is worth getting for you and your PC. If you have a rig that is going to be able to run games at around 144 frames per second then this is going to be the lowest priced, high quality 144hz monitor on the market hands down. If your PC isn’t able to go up to 144 FPS on your favorite games then you’re not going to be able to fully utilize this display. Be sure to know whether or not if your PC is good enough for a monitor like this and if it is, this is the one to get. You should also be checking out all of the reviews of this one on Amazon. There are so many people that have this screen and vouch for it.. read for yourself! Are you looking into getting a PC that’ll be able to use this display? Then be sure to also check out this build guide that is more than capable of fully utilizing this monitor! So, are you going to be getting this monitor? What is your favorite part about the VG278Q? Tagged 1080p, 144hz, asus, review, vg278q. Bookmark the permalink. I’m currently in the process of setting up a new pc, and this Asus monitor looks great! I’ll have to add it to my list of possible monitors as its not to expensive and has many qualities. I’ve always been a fan of Asus products with my first one being a Asus tablet a few years back, notably I was on a budget however there products always seem to do the job. Since I’m looking to compare other monitors is there any others you would recommend that are under $300? This one takes the cake for 144hz. But if you’re looking for something cheaper that doesn’t have 144hz then you should look at the variations available on the ASUS VS228H monitor as well. It’s much cheaper, at 60hz refresh rate and has a similar size available as well. How topical is this? I was just looking for a new monitor. 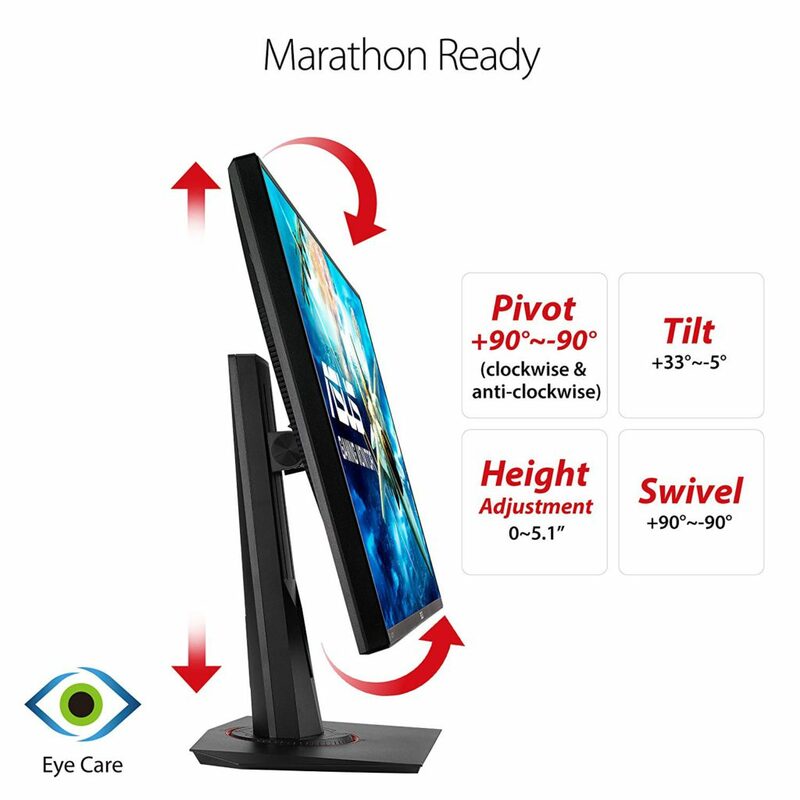 I am someone that is exclusively a PC gamer and online marketer so as you can guess – a monitor is REALLY important. This review definitely showcases the value in this monitor, with the widescreen view and (most importantly for me as a gamer) the quick refresh rate. This is already added to my wishlist following viewing this site! I’ve had this monitor for a little over a week now as of the time of this writing, I’ve had the best experience while gaming that I’ve ever had and that might sound “bias” or that I’ve had some deal with Asus but I don’t and I mean it. I should have had a 144hz monitor a long time ago! If you’ve got the right kind of rig to handle 144hz (meaning that you can get around 144 FPS on your most played titles) and you’re wanting the bigger screen space then this is definitely the most bang for your buck. Wow, I really like this Asus VG278Q for some good reasons. I like it’s 1920 x 1080 pixels resolution. Also, it response time which is 1ms and the 144hz refresh rate. I think these key features are what I will always look for when buying any monitor. Even though as you said, it’s speakers are not the best, I don’t think I will buy a monitor purposely for the sake of it speakers. So, for me personally, these features make this Asus VG278Q a very good monitor worth it. Since you said you tried it before, I will also give it try to see for myself how it works. Thanks a lot for sharing these information with us. It’s definitely right in the sweet spot in terms of high refresh rate and fast response time. It’s not even having trying it before, it’s the one I’m actively using with my build! 100% recommended if you’re looking for a monitor with these types of specs and if you have the rig to utilize it. I assume he’s been asking about this monitor if you’re looking into reviews and what not and to answer your question, absolutely! If he’s looking for a top-of-the-line 1080p gaming monitor then this is it – hands down. I’m digging the blue light filter settings, it is definitely better on the eyes especially while playing at night. i have the same monitor and the text is so blurry that i have to use my old monitor to do everything else so my question is: what setting did you use to be able to have that monitor your main one !??! Really? There is definitely an issue either with your drivers or with your video cable… Maybe it’s in the settings as well but I didn’t mess around a whole lot with the monitor’s settings. Have you updated your drivers? Have you looked in the Nvidia/AMD control panel and peeped around at what the issue might be? This monitor is crystal clear, love using it… so it has to be a problem on your end? Let me know, we’ll try to figure it out together!